Our Middle School has been advocating Good Digital Citizenship (GDC) for three years now. We have been at the forefront of bringing standards of GDC to our students in Grades 6-8. Its great to see other schools and organizations now realizing the importance of these standards and start to implement them. 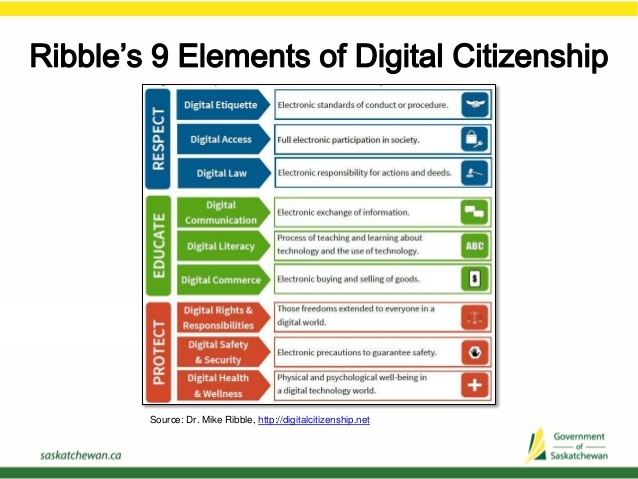 The government of Saskatchewan has recently published their plan to implement digital citizenship in their schools. Their publication has some interesting studies that reinforce our need to continue teaching GDC. The International Society for Technology in Education (ISTE) has compiled a list of standards for students, teachers, and administrators that outline the technology related skills that students need to master. 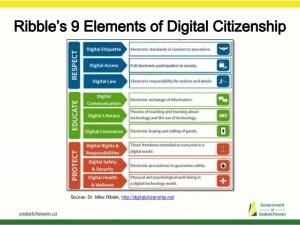 Among the list is the development of Good Digital Citizenship. Dr. Mike Ribble has research on the nine elements of digital citizenship that match our Langley Christian Middle School GDC elements. I like his addition of grouping the nine elements into three categories; Protect, Educate, and Respect.